The situation remains tense: two crew members were filmed ejecting from the stricken aircraft – early reports from Reuters said it had video of one of the crew pilot seemingly dead on the ground. Russia later confirmed two of its personnel were dead. One of the pilots and a marine in a helicopter flying a rescue mission for the two pilots that was attacked by rebel fire. Russian president, Vladimir Putin, called the incident a “a stab in the back, carried out by the accomplices of terrorists”. He said the shooting down would have “significant consequences, including for Russia-Turkish relations”. Meanwhile, at a meeting of NATO’s North Atlantic Council in Brussels, diplomats condemned Russian incursions but said Turkey should have escorted the Russian warplane from its airspace. “There are other ways of dealing with these kinds of incidents,” one unnamed diplomat told Reuters. This comes at a time, following the Paris attacks, when the US and its Western allies had been reaching a tentative agreement with Russia to solve the previous impasse over a possible transition of power in Syria. Turkey and other Sunni Middle Eastern states are ranged against the Assad regime and not happy at the prospect of a deal that would leave him in power – even if only on a temporary basis. Iran and Russia have been keen to see their Syrian ally remain in power, although Russia has been coming around to the idea of a transition but has steadfastly argued that it is imperative to defeat Islamic State militarily first. After the Paris attacks, France was swift to act against IS and NATO has appeared to accept that the first priority is to act against the terrorist group, leaving the Assad question for the time being. Will that common ground be lost over the downing of the Su-24? It is important to keep in mind that while shooting another country’s plane down could be see as an act of war, it has rarely precipitated a larger conflict. The last time a NATO member shot down a, then Soviet, fighter aircraft (MiG-15) was in 1953, destroyed by the United States (US) during the height of the early Cold War tension and towards the stalemate that would end the Korean War. Many NATO fighter aircraft were shot down during the 1950s – though this tailed off as the Cold War became less war and more hot air. But the prospect for such an event is always greater when you have adversaries in the sky together. NATO and Russia both had planes in the sky over the former Yugoslavia in the 1990s – happily they avoided the sort of incident which threatens to set the old adversaries at loggerheads once again. When Russia began flying over Syria in August 2015, there was considerable anxiety over how to maintain a safe theatre, at least in the air, for manned and unmanned aircraft. By early October, both the Turkish and US governments were stating that there was concern over Russia’s violation of Turkish airspace and the bombing of pro-Turkish and pro-Western rebel forces. NATO has issued a stern ultimatum … We cannot endure it. Some steps that we do not desire are being taken. It is not suitable for Turkey to accept them. This is also beyond the principles of NATO. Russias' foreign ministry responded with the assurance that any violation of Turkish airspace had been accidental and would be prevented in the future. Afterwards the US secretary of state John Kerry said that “it is precisely the kind of thing that, had Turkey responded under its rights, could have resulted in a shootdown”. He said there was increasing evidence that Russia is violating Turkey’s territorial sovereignty. Where does this leave Russia’s relationship with Turkey and NATO? The Russian government has been quick to avoid calling this incident a Turkish act of aggression. 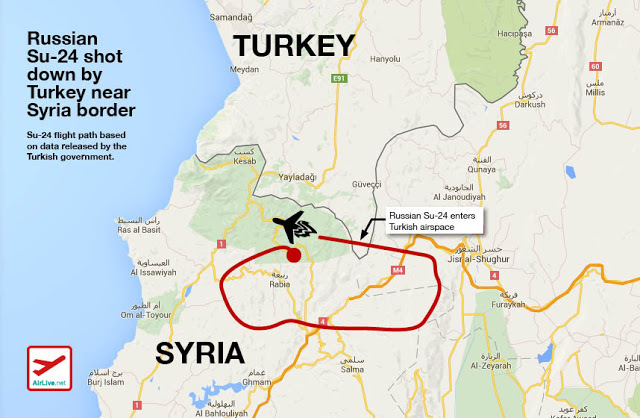 The Turkish government meanwhile stated that its aircraft had warned the Russian Su-24 ten times before taking action. No longer is there a NATO-Russia Council where Russia could have become more operationally engaged to avoid such events, whether accidental or otherwise. However, NATO and Russia established a hotline in May 2015 which will be useful in making sure that Russian and NATO heads remain cool as we discover what happened and more about the state of the Russian pilots. There is a clear problem here in the larger conflict. Turkey is against the continuation of the Assad regime. Russia’s entry into the war may make Western leaders more acquiescent in allowing Bashar al-Assad to remain in power for longer if not for too long. Russia and Iran are against removing Assad from power. The rules of engagement should have prevented a Russian fighter aircraft from further violating Turkish airspace – but of course we do not know how often this has happened or if the pilots were just unlucky the Turkish F16s were in the same vicinity. The worry is that this event marks a transition in the rules of what some have referred to as the New Cold War. Already we have seen situations where RAF fighter aircraft have locked on to and been cleared for firing on hostile Russian aircraft in the Middle East. Will this escalate? Are we likely to see more fighter aircraft downed – for whatever reasons – with the possibility of further conflict? This is the main concern – especially as Russian aircraft and submarines continue to violate national airspaces. And then there is NATO’s continued testing of Russian radar along the Russian border and Arctic Ocean which is not exactly helping relations. As long as Russia and Turkey are able to work this out between themselves, it is likely that Russia will simply navigate more carefully, rather than triggering a further deterioration of the war which has claimed enough victims already. David Galbreath is Professor of International Security at the University of Bath and Director of the Centre for War and Technology. His current research is on military transformation, the role of science and technology in defence and security, and ethics and trust in adaptive systems. 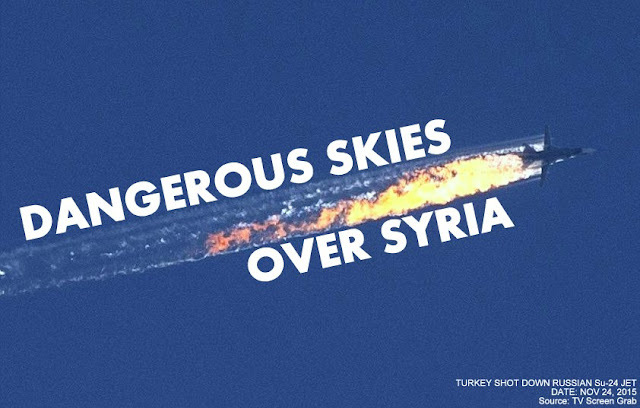 "Could downing of Russian jet over Turkey really lead to a wider war?"